Dr M.A. Persinger has been studying this phenomenon for decades, under the name of the “Sensed Presence” (Dr Blanke calls it the FoP, or “Feeling of Presence”), and his research lends weight to Blanke’s recent work. Before Blanke’s experiment, Dr. M. A. Persinger had done many studies on laboratory-elicited sensed presences, and published a couple of articles laying out his ideas about why it happens. A search at pubmed.com showed 25 results for the search string persinger sensed presence -and that’s only the ones that mention it in the summary or abstract. There are others (about 15 more) that discuss it in the body of the papers. Persinger’s God Helmet has recently had some new and independent corroboration from researchers in Brazil (showing that its effects are not due to suggestibility). Blanke’s paper confirms other aspects of Persinger’s findings, this time that the sense of a presence has its origins in the human brain, and can be explained as an alteration in the sense of self. Persinger and Blanke agree that when people are feeling the sense of a presence (or feeling of presence) they’re actually perceiving a part of themselves. Both Persinger and Blanke agree that the temporo-parietal region plays a role, though they may not agree on whether or not it plays the central role. They emphasize different places in the brain, but this may only reflect their different research methods. Persinger used neural stimulation with magnetic fields to create the sensed presence feeling, while Blanke (et al.) used a robot. Persinger was the first to elicit this sensation using magnetic brain stimulation, while Blanke is the first to create it using a robot. However, one of the 14 authors of the Blanke (et al.) paper seems to have made a mistake, erroneously saying “the FoP (feeling of presence – author) has never before been induced experimentally”. Dr. M.A. Persinger has done just that (sample of this work here), but he used a different name (“sensed presence” instead of “feeling of presence”). Blanke spoke about this in a filmed interview with the Washington Post, where he said he was to first to elicit this sensation using a robot. Typos and copy-editing errors happen in scientific papers, just like any other kind of writing. 3) The insula (in five of Blanke’s patients). The temporoparietal cortex, the first area, is the location for the magnetic coils (“solenoids”). This is the area on the surface of the brain most clearly involved in the feeling of a presence in Persinger’s “God Helmet” experiments, where one way of applying his magnetic signals elicited the sense of a presence in 80% of his subjects. Persinger’s research also implicates some areas in the limbic system, deep in the brain. Some commentators have claimed that Persinger’s published effects are due to suggestibility, but this has been ruled out by a recent study that replicated some of Persinger’s work. Blanke wrote that his research especially associated the frontoparietal area with the feeling of a presence. Persinger noted the frontoparietal cortex’s involvement in the Sensed Presence experience in a paper published in 2008. The frontoparietal regions have also been observed to participate in “speaking in tongues“, as Persinger noted in a 2009 paper. It could be argued that Brodmann’s area 7 is not in the frontoparietal area, but rather in the parietal lobes, (toward the back of the brain), but naming conventions in brain science aren’t always consistent. The insula has been known to contribute to sensed presence experiences, as one published case shows. Persinger recorded “enhanced activity extending into the insula” when he took EEG recordings from Sean Harribance, the remote viewer, while the subject was “calling an angel”. This feeling of an angelic presence was part of his psychic practices. Of course, Angels and Ghosts are both taken as correlating with brain activity, and there is evidence that the insula is involved, as both Blanke’s and Persinger’s work demonstrate. Deciding which brain regions ’cause’ a feeling or sensation is always difficult. Here’s a metaphor: A television is controlled by the on/off button. At first glance, the remote control might seem to cause the images to appear. However, the power button could also be said to be the cause, especially when you press it, right? In fact, they’re both part of a single circuit that controls the whole television, including the images, the volume, the contrast and the brightness, and so forth. So it may be with feeling the sense of a presence. Persinger and Blanke’s two very different methods might provide two different points of entry to the same circuit. In simpler terms, Blanke’s experiment elicited the sense of a presence from the outside in, and Persinger created it stimulating it from the inside out. When Blanke and his colleagues had their robot touch their subject’s back at the same time they moved their fingertip-joystick, so they felt they were touching their own back. When Blanke introduced a 500 msec delay (so the robot waited half a second before passing on the motion to the subject), the subjects began to feel that they were being touched by a ghost, or another person. The illusion was so powerful that some subjects felt there were several people (up to four) standing behind them. Two of the subjects felt uncomfortable enough to ask to stop the experiment. It may seem that there’s no connection between the FoP Blanke’s group created (by poking their subjects in the back with a robot arm, directed by a time-delayed control stick) and the sense of a presence in other contexts, but Blanke included a simple test that strongly implies they are made of the same “stuff”. While his subjects were being gently prodded by the robot and feeling it was a ghost, he asked them how many people they ‘felt’ were in the room next door. The ones who were asked this question while they were feeling a presence also ‘felt’ there were more people in the next room. The difference was about 20%. Persinger’s God Helmet uses four magnetic coils over each side of their heads, but only one is activated at a time. They take turns producing the magnetic field, changing (you guessed it!) every 500 msec. The time lag that made the subjects feel they were being touched by a non-existent person (or ghost) is also the same time lag that Persinger found made the sensed presence most likely, when it was used to ‘time’ the cycle for his magnetic coils. Persinger & Blanke had differing results, but certainly not conflicting ones. Instead, Persinger and Blanke’s findings confirm and partly replicate each other. The differences in their experimental techniques can account for the differences in their findings. Persinger & Blanke both report vestibular effects from their experiments. This refers to sensations where people feel they are moving when they’re not. Vertigo is one example of a vestibular sensation. 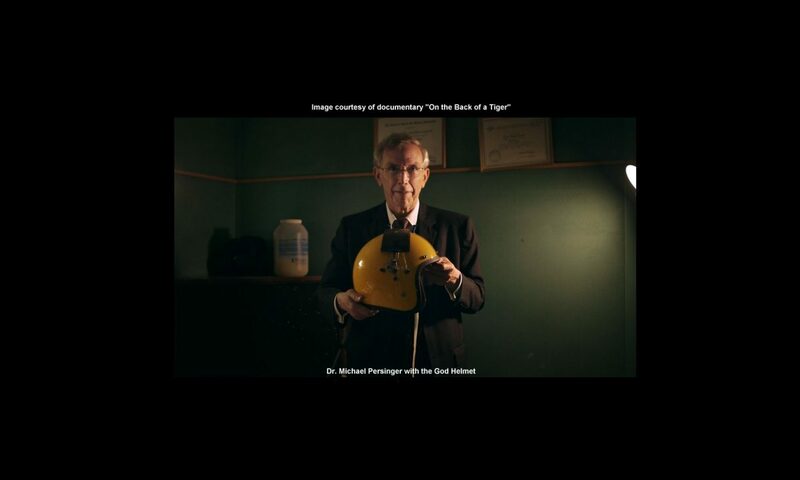 Persinger has elicited vestibular effects from his God Helmet, and in one case, found that women were more likely to report them than men. Blanke found that when subjects felt a presence, they also felt like they were drifting backwards. Persinger found that these sensations precede the sensed presence in some circumstances. What Causes the Feeling of a Presence? Blanke wrote: “… the FoP is caused by focal brain lesions.” My opinion is different. I certainly agree that some feelings of a presence are caused by lesions, but I’m also convinced that there is an evolutionary basis for this sensation. It’s more likely in times of stress, especially during or just after potentially lethal situations. In our early evolutionary history, stressful times were also times when we had a problem – and we needed a solution. We could say the sensed presence can help us ‘think outside the box’ when we really need to – when we’re faced with a threat. It offers us a way to achieve new insights – one that works outside our usual cognitive habits. To understand this, we need to look at Persinger’s theory about what’s happening in moments when we sense people who aren’t there. In Persinger’s view, we have two senses of self – one on each side of the brain. Ordinarily, they work together seamlessly, giving us a unified feeling; a single but subtle feeling, that we exist – as one being. Most of the time, we exist in the self on the left side of the brain, with its greater access to the language centers. That’s why we’re such a verbal species. Our minds keep coming up with words even when we’re alone (“mind chatter”). Many people even talk to themselves -out loud – if they’re alone too long. We talk to others; its our main way of relating with them, and we often feel uncomfortable being with someone in silence. Language is a part of our “selves”. The “self” on the right side of the brain is subordinate most of the time. It works in the shadow cast by the “linguistic self” on the left side, to use a metaphor. It contributes ‘felt’ aspects of our thoughts, speech, body language and so forth. Because is knows things without words, it knows in non-linear ways (has an “associative cognitive style”). It takes a lot from the memory retrieval and creation pathways at work in the right side of the brain (in the hippocampus and surrounding cortex), letting us see connections between things that affect us in more ways than our talkative ways of thinking could ever cope with. When the two senses of self aren’t communicating they way they usually do, the self on the left can perceive its counterpart directly, but not through any of our usual senses. Only one of us can occupy our body, or identified as the “first-person singular” (the ego), so the other, the right-hemispheric self is evicted. It’s bothering its neighbor on the left. Its encroaching on its property, and so it has to go. Where does it go, and how is it perceived once its gotten its notice to clear the premises? Its felt as a being or presence outside our body’s space. The feeling of presence. Blanke wrote “the present data reveal the fine balance between the distributed cortical brain mechanisms in humans that generate the experience of ‘‘self’’ and ‘‘other,’’ which, if distorted, give rise to the FoP.” I agree completely. It may be that Blanke’s access to this circuit was through the body (sensorimotor), while Persinger’s is through the mind (affective and cognitive), as both run through the brain. The sense that another person is there when we’re alone is a “social” hallucination, just like smelling smoke when the air is clear is an olfactory hallucination. A smell that isn’t there implies a mis-firing in the olfactory bulbs. Deja vu implies a mis-matching between our perception of the present moment and our sense of that past. The sensed presence is an alteration in our sense of self-and-other, but its one of the functions of that sense, and is not – not at all – intrinsically pathological. That sense, that there is another person, being, entity, or spirit standing behind you is the source for ghosts, “spirit familiars”, doppelgangers, angels, “The Muse”, both Gods & demons, and a host of other seemingly non-physical beings. All of them are variations on the same theme. Thus, God, including the God of our prayers, is a manifestation of our sense of self from the right side of the brain – the ‘self’ that thinks outside the box created by the left-brain’s sense of self. Prayer is a deliberate attempt to create the sensed presence (or Feeling of Presence). Its practiced in all known cultures, and has been through all known history. We are a species that prays. Huge numbers of people (I don’t know of any study that ever counted them) feel the presence of the god they pray to when they’re in prayer. When people pray about their troubles and difficulties, they’re appealing to God, but they’re (only? also?) accessing the creativity that only the right hemisphere can manage (suggested reading on this subject). To put it a bit differently, it’s the left hemisphere’s way of trying to quiten itself down, so the right hemisphere’s normally-subordinate, intuitive way of thinking (“cognitive style”) can come through. My book has a chapter on prayer that takes this view. Many, probably most, of the people who feel the presence of a (putative) non-physical being don’t have brain lesions or brain disorders of any kind. While its true that epilepsy can elicit the sense of a presence, much of the phenomena that epilepsy creates appear when a seizure recruits pathways that support it naturally. There are pathways used to remember music, and when these pathways are caught in a seizure, the person will probably hear music while its happening. The feeling of a presence is a natural function that can be triggered through epilepsy, but that doesn’t make it an epileptic phenomena, and can’t be explained only in terms of the lesions that provoke epileptic events. Its the foundation for spiritual sentiments that widen our cognitive strategies and refine our behaviors. Its part of our evolutionary heritage. However, not all people are equally prone to either the sense of a presence, or the urge to pray. According to Persinger’s normative data (based on questionnaires that asked about the sense of a presence, among other things), about 1/3 of the population won’t feel such presences (and probably not feel drawn to prayer), 1/3 will feel them once in a while, and 1/3 will feel them often. Epileptics and mystics are both at the extreme end of this spectrum, but for very different reasons. We also expect to find schizophrenics at the same high end of this spectrum. The disturbances in their brains will also include some of the pathways that support our ability to invoke presences, a skill that makes our thinking even more skilled, helping us to be less killed. The intense prayer experiences of our early shamans contributed to the survival of our early communities, and thus, our species. As a final note, here are references for 27 papers on the Sensed Presence that Persinger published Prior to Blanke’s (et al.) fascinating experiment. Each is linked to it’s abstract. Booth JN, Persinger MA. Discrete shifts within the theta band between the frontal and parietal regions of the right hemisphere and the experiences of a sensed presence. Journal of Neuropsychiatry & Clinical Neuroscience. 2009 Summer;21(3):279-83. Meli SC, Persinger MA. Red light facilitates the sensed presence elicited by application of weak, burst-firing magnetic fields over the temporal lobes. International Journal of Neuroscience. 2009;119(1):68-75. Persinger MA, Tiller SG. Case report: A prototypical spontaneous ‘sensed presence’ of a sentient being and concomitant electroencephalographic activity in the clinical laboratory. Neurocase. 2008;14(5):425-30. St-Pierre LS, Persinger MA. Experimental facilitation of the sensed presence is predicted by the specific patterns of the applied magnetic fields, not by suggestibility: re-analyses of 19 experiments. International Journal of Neuroscience. 2006 Sep;116(9):1079-96. Booth JN, Koren SA, Persinger MA. Increased feelings of the sensed presence and increased geomagnetic activity at the time of the experience during exposures to transcerebral weak complex magnetic fields. International Journal of Neuroscience. 2005 Jul;115(7):1053-79. Persinger MA, Koren SA. A response to Granqvist et al. “Sensed presence and mystical experiences are predicted by suggestibility, not by the application of transcranial weak magnetic fields”. Neuroscience Letters. 2005 Jun 3;380(3):346-7; author reply 348-50. Epub 2005 Apr 21. Persinger MA. The sensed presence within experimental settings: implications for the male and female concept of self. Journal of Psychology. 2003 Jan;137(1):5-16. Persinger MA, Healey F. Experimental facilitation of the sensed presence: possible intercalation between the hemispheres induced by complex magnetic fields. Journal of Nervous and Mental Disorders. 2002 Aug;190(8):533-41. Tiller SG, Persinger MA. Geophysical variables and behavior: XCVII. Increased proportions of the left-sided sense of presence induced experimentally by right hemispheric application of specific (frequency-modulated) complex magnetic fields. Perceptual & Motor Skills. 2002 Feb;94(1):26-8. Suess LA, Persinger MA. Geophysical variables and behavior: XCVI. “Experiences” attributed to Christ and Mary at Marmora, Ontario, Canada may have been consequences of environmental electromagnetic stimulation: implications for religious movements. Perceptual & Motor Skills. 2001 Oct;93(2):435-50. Persinger MA, Koren SA, O’Connor RP. Geophysical variables and behavior: CIV. Power-frequency magnetic field transients (5 microtesla) and reports of haunt experiences within an electronically dense house. Perceptual & Motor Skills. 2001 Jun;92(3 Pt 1):673-4. Persinger MA. Subjective improvement following treatment with carbamazepine (Tegretol) for a subpopulation of patients with traumatic brain injuries. Perceptual & Motor Skills. 2000 Feb;90(1):37-40. Cook CM, Persinger MA. Experimental induction of the “sensed presence” in normal subjects and an exceptional subject. Perceptual & Motor Skills. 1997 Oct;85(2):683-93. Persinger MA. Sense of a presence and suicidal ideation following traumatic brain injury: indications of right-hemispheric intrusions from neuropsychological profiles. Psychological Reports 1994 Dec;75(3 Pt 1):1059-70. Tiller SG, Persinger MA. Elevated incidence of a sensed presence and sexual arousal during partial sensory deprivation and sensitivity to hypnosis: implications for hemisphericity and gender differences. Perceptual & Motor Skills. 1994 Dec;79(3 Pt 2):1527-31. Johnson CP, Persinger MA. The sensed presence may be facilitated by interhemispheric intercalation: relative efficacy of the Mind’s Eye, Hemi-Sync Tape, and bilateral temporal magnetic field stimulation. Perceptual & Motor Skills. 1994 Aug;79(1 Pt 1):351-4. Persinger MA, Bureau YR, Peredery OP, Richards PM. The sensed presence as right hemispheric intrusions into the left hemispheric awareness of self: an illustrative case study. Perceptual & Motor Skills. 1994 Jun;78(3 Pt 1):999-1009. Dittburner TL, Persinger MA. Intensity of amnesia during hypnosis is positively correlated with estimated prevalence of sexual abuse and alien abductions: implications for the false memory syndrome. Perceptual & Motor Skills. 1993 Dec;77(3 Pt 1):895-8. Persinger MA. Vectorial cerebral hemisphericity as differential sources for the sensed presence, mystical experiences and religious conversions. Perceptual & Motor Skills. 1993 Jun;76(3 Pt 1):915-30. Review. Persinger MA. Transcendental Meditation and general meditation are associated with enhanced complex partial epileptic-like signs: evidence for “cognitive” kindling? Perceptual & Motor Skills. 1993 Feb;76(1):80-2. Persinger MA. 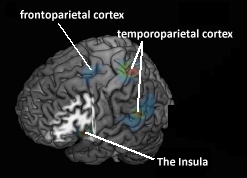 Paranormal and religious beliefs may be mediated differentially by subcortical and cortical phenomenological processes of the temporal (limbic) lobes. Perceptual & Motor Skills. 1993 Feb;76(1):247-51. Persinger MA. Enhanced incidence of “the sensed presence” in people who have learned to meditate: support for the right hemispheric intrusion hypothesis. Perceptual & Motor Skills. 1992 Dec;75(3 Pt 2):1308-10. Munro C, Persinger MA. Relative right temporal-lobe theta activity correlates with Vingiano’s hemispheric quotient and the “sensed presence”. Perceptual & Motor Skills. 1992 Dec;75(3 Pt 1):899-903. Lavallée MR, Persinger MA. Left ear (right temporal lobe) suppressions during dichotic listening, ego-alien intrusion experiences and spiritualistic beliefs in normal women. Perceptual & Motor Skills. 1992 Oct;75(2):547-51.